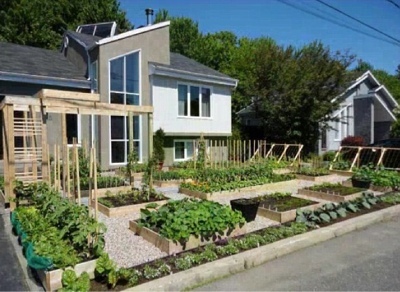 I'm sure you've heard that there are people all over North America being fined and threatened with fines and jail time because they grow vegetables and/or fruit in their front yards. The city or town will have a bylaw saying something like 'suitable plantings are required'. It is often subjective. Take the Drummondville Quebec garden. It is beautiful. First the city said they were going to tear it out if the owners didn't. There was an outcry and the city said they could keep it until harvest at which time they were rewriting the bylaw to expressly forbid food growing in the front yard and it would have to come out. It hit the blog world, Facebook etc. and people from everywhere were writing to Drummondville council and it made the press etc. So, the city took a step back, decided to rewrite the bylaws to allow veggie gardens in the front yard and it sounds like implementing an Urban Farming bylaw. As if that weren't enough, they have asked the couple who owns the home to help with the bylaw. I love it. This is happening so often that I actually went to town hall here to see if I could grow fruit trees or veggies in the front yard. The woman looked a bit puzzled. I explained what was going on out there, and she said. 'it's okay, you're in Sidney'. I'll never forget that. I love this town. Now if they would just get that bylaw amendment done to allow chickens. Then I move on to bees. We currently can't have them. So that brings us to my gardens. I have a rhododendron and Japanese Maple garden along the front of my house. We just mulch it and ignore it. It is along the north side, so in their summer it is cool and only gets morning sun. Allan wants to edge it with nice looking stone blocks. I was thinking that I could bring the soil level up a bit and plant lettuce and spinach there in the summer. There is a young couple a few blocks from here that have Bright Lights Swiss Chard growing along their driveway. At this time of year it glows. *This post was written a while ago and I missed it. Still timely and valid. People are still being persecuted for front yard veggies, chickens that are not allowed, zoning, and on and on. For a real eye opener, google Dirk Becker Lantzville. This organic gardener has been the subject of a hostile neighbours harassment and the town jumped right on board with the neighbour. They are now exhausted by the fight and are putting Compassion Farm on the market. Sad that people can't grow their own food! Looks much better than some of the lawns around my place that are full of weeds that go to seed and spread to my yard. Some people do next to nothing with their lawn and it is not only an eyesore but also a hassle for those living near by. Give me a garden to a neglected lawn any day! I have a fig and Jonagold apple in the front yard. So far. I am SO not done with it yet.